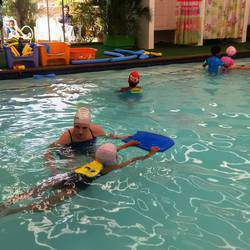 Starfish is an established swimming school that has been operating for over 15 years in the Midrand area. We are situated in Vorna Valley, Midrand. The pool is a decent 12m X 6m in size and enclosed by a large brick building, which is sunny and non-threatening. There is a double step along the entire length of the pool so that the little ones are able to sit and stand along the side of the pool making them feel comfortable in the knowledge that they have a solid footing below them. The pool temperature is maintained at an average of 32 degrees throughout the year. We believe that water temperature is a very important factor when teaching children to swim. At Starfish we believe in teaching the correct technique from day one all while having FUN!